Khogali wrote an op-ed in The Toronto Star on Sunday, breaking her silence on a story that's threatened to overshadow the Black Lives Matter protest. She responded to a tweet from February that resurfaced last week where she said, "Plz Allah give me strength not to cuss/kill these men and white folks out here today. Plz plz plz." 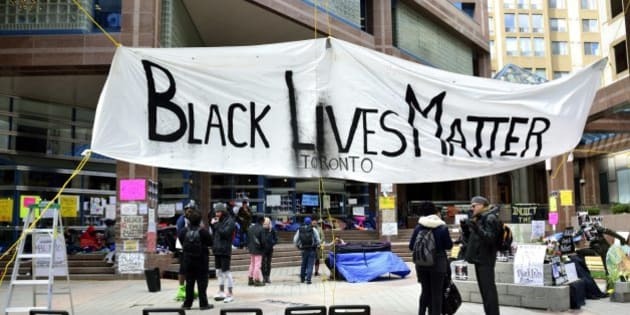 Yusra Khogali, co-founder of Black Lives Matter Toronto wrote an op-ed in The Toronto Star on Sunday, breaking her silence on a story that's threatened to overshadow the Black Lives Matter protest. She responded to a tweet from February that resurfaced last week where she said, "Plz Allah give me strength not to cuss/kill these men and white folks out here today. Plz plz plz." Newstalk1010 host Jerry Agar, who Khogali says has a "long, well-documented record of enmity" to the group's "anti-racist goals" posted it on social media. For some, anxiously waiting for the movement to be derailed, Jerry Agar's post couldn't have come at a better time. In the two weeks protesters camped outside in unforgiving weather conditions, they made a lot of progress in having their demands met. City councillors agreed to pass a motion at city hall to investigate interactions between black people, the Toronto police and the Special Investigations Unit. Afrofest had been restored to two days, after the second day had been taken away by city councilors due to noise complaints from residents near where the festival took place. And Ontario Premier Kathleen Wynne agreed to have a public meeting with the group. Let's get one thing straight. The tweet was in very poor taste. It gave many Torontonians the ammunition they needed to uphold their narrow views of BLM -- that its an organization full of angry black people that don't value any lives except for black ones. Our experiences tell you that the threats we face are very real. According to prominent Toronto journalist Desmond Cole, the tweet was simply a public prayer "not to harm those who harm her." In his Thursday column in the Toronto Star, he called it "an honest appeal to restraint and wisdom in the face of violence, racism, and misogyny." Khogali referred to the tweet as the use of "a turn of phrase, a rhetorical flourish, to voice my frustration and dared to be a person calling for justice." And while some might think that Cole and Khogali are downplaying the tweet or making excuses, the experience of everyday black Canadians would tell you otherwise. Our experiences tell you that the threats we face are very real. Our lived experiences show that we are being profiled and shot by police and we're the victims of a very unjust and inherently racist and sexist society. One key thing was ignored in the coverage of this story and it frustrates me as both a journalist and a woman of colour. Khogali summed it up quite nicely in saying, "I am not a public official. I am not a police officer. The state does not entrust me with violent weaponry. I have never contributed to the mass targeting of a community." The BLM movement in Toronto has done an excellent job of remaining peaceful, calm and as organized as any protest can be. In other words, the media has chosen to focus on words posted on social media that were not followed up with in any way, shape, or form, throughout the entire BLMTO movement, rather than the systemic and institutionalized forces that are embodying the threat behind the tweet. The mainstream media coverage of this particular story up until now also relays a very clear message to the protesters and to the news audience. That message is that Khogali's words -- and those of protesters -- speak louder than their actions. And they shouldn't. Not when public apologies and vague, generic statements from officials and the refusal to name officers who kill black citizens have always overshadowed the actual attacks on our community. The BLM movement in Toronto has done an excellent job of remaining peaceful, calm and as organized as any protest can be. They've succeeded in garnering the attention of various governments, politicians and lawmakers. They've established a very clear agenda that they've shared with the public. Their efforts have been passionate, consistent, non-violent and worthy of applause, despite the movement being bashed constantly on social media. Khogali writes that she has received several "disturbing" death threats, from white supremacists in Canada. Where is her protection from them? She writes that since this story has gained so much traction in the media, the accomplishments and progress BLMTO has made towards equality and justice have been drowned out, that journalists have harassed her for a comment, but were nowhere to be found during their tent city. Those who know Khogali refer to her on Facebook as "beautiful, free" and a "radical source of love, light and transformative energy." But media outlets have described her as "being prone to use hyperbolic rhetoric," "disturbing, emotional and controversial," and Mayor John Tory said the tweet was "incendiary." According to Khogali, Tory ignored BLMTO while protesters "fought for [their] humanity" for those two weeks outside of police headquarters. Yet he responded to the tweet within just 24 hours. But Tory's remarks, I would argue, highlight the larger idea of what it means when black people gather in small or large groups, particularly in public places -- that danger is present. We saw the overwhelming police presence when the group established their tent city. Videos surfaced of protesters being pushed, shoved and kicked by police. When the group held a vigil outside Wynne's home for 45-year-old Andrew Loku, a Sudanese immigrant gunned down by police, the Toronto police's chemical, biological, radiological, nuclear and explosive unit was called in because the group left an empty bottle of wine that was full of water. In Toronto, and in several other places, black presence and congregations equate to danger. Rather than denounce Khogali for words that were spoken in the face of centuries of abuse, dehumanization, inequality, racism and sexism. Rather than argue with her about fairness, and whether she has the right to feel the need to pray for strength and wisdom in the face of death threats from white supremacists. Rather than question her ability to lead a protest for things that should come as basic human rights... I thank her and I stand with her. Because the media's focus on BLM shouldn't change ours. And thankfully, it hasn't changed hers.